Eleanor Margaret Burbidge (née Peachey), FRS (born August 12, 1919 in Davenport) is a British-born American astrophysicist, noted for original research and holding many administrative posts, including Director of the Royal Greenwich Observatory. During her career, she served at the University of London Observatory, Yerkes Observatory of the University of Chicago, Cavendish Laboratory in Cambridge, England, the California Institute of Technology, and, from 1979 to 1988, was first director of the Center for Astronomy and Space Sciences at the University of California at San Diego (UCSD), where she has worked since 1962. Burbidge started studying astronomy in 1936, at University College, London, was graduated in 1939, and received her Ph.D. at University College in 1943. She was turned down for a Carnegie Fellowship in 1945 because the fellowship would have meant that she would have had to observe at Mount Wilson observatory, which was reserved only for men at that time. In 1950, she applied for a grant at the Yerkes Observatory in Williams Bay, Wisconsin, and went to the United States in 1951. Her research interests focused on chemical abundances in stars. She returned to England in 1953 and started research in collaboration with her husband Geoffrey Burbidge, William Alfred Fowler, and Fred Hoyle. Based on experimentation and observational data initiated by Margaret and Geoffrey Burbidge, the team produced a hypothesis that all chemical elements might be synthesized in stars by nuclear reaction (known now as stellar nucleosynthesis). The resulting astrophysical theory, which was published in 1957, was called the B2FH theory after the participants who collaborated in the research (Burbidge, Burbidge, Fowler, Hoyle). This theory has been the basis for a substantial field of research in astrophysics. After ten years, in 1955, she finally gained access to the Mount Wilson Observatory, posing as her husband's assistant. When the management found out, they eventually agreed that she could stay, if she and her husband went to live in a separate cottage on the grounds, rather than staying in the dormitory that had been designed for men alone. 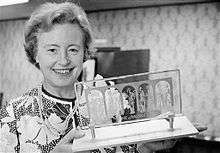 In 1972 she became director of the Royal Greenwich Observatory. This was the first time in 300 years that that directorship was not associated with the post of the Astronomer Royal, which instead, was awarded to radio astronomer (and later Nobel prize winner) Martin Ryle. Burbidge left this post in 1974, fifteen months after accepting it, when controversy broke out over moving the Isaac Newton Telescope from the Observatory to a more useful location. Experiences such as those turned Burbidge into one of the foremost and most influential personalities in the fight to end discrimination against women in astronomy. Consequently, in 1972 she turned down the Annie J. Cannon Award of the American Astronomical Society because it was awarded to women only: "It is high time that discrimination in favor of, as well as against, women in professional life be removed". Twelve years later the Society awarded her its highest honor, regardless of gender, the Henry Norris Russell Lectureship. In 1976, she became the first woman president of the American Astronomy society. In 1977, she became a United States citizen. In 1981 she was elected president of the American Association for the Advancement of Science (AAAS); she also has served as vice-president and president of the American Astronomical Society. In 2003, Burbidge was inducted into the Women's Museum of California Hall of Fame honoring her career and achievements. On April 2, 1948, Margaret Peachey married Geoffrey Burbidge, also a theoretical astrophysicist, with whom she collaborated in one of the most significant astrophysical theories of the century. Their daughter, Sarah, was born in late 1956. Geoffrey Burbidge died in 2010. After receiving her Ph.D. in 1943, she started to research galaxies by linking a spectrograph to telescopes. At the Yerkes Observatory in the USA her work involved studying B stars and galaxy structure. In 1957, the B2FH group showed the famous result that all of the elements except the very lightest, are produced by nuclear processes inside stars. For this they received the Warner Prize in 1959. In her later research she was one of the first to measure the masses and rotation curves of galaxies and was one of the pioneers in the study of quasars. At UCSD she also helped develop the faint object spectrograph in 1990 for the Hubble Space Telescope. Currently, she is a professor emeritus of physics at UCSD and continues to be active in research, such as engaging in non-standard cosmologies such as, intrinsic redshift. Burbidge has contributed to over 370 articles on astronomical research. ↑ "Henry Norris Russell Lectureship". American Astronomical Society. Retrieved 13 August 2013. 1 2 Yount, Lisa (1996). Twentieth-century women scientists. New York: Facts on File. p. 46. ISBN 0816031738. 1 2 "Margaret Burbidge: 2003 Trailblazer". Women’s Museum of California. Retrieved 13 August 2013. ↑ Faulkner, John (18 February 2010). "Geoffrey Burbidge obituary". The Guardian. ↑ "Book of Members, 1780–2010: Chapter B" (PDF). American Academy of Arts and Sciences. Retrieved July 25, 2014. ↑ "E. Margaret Burbidge". National Academy of Sciences. Retrieved July 26, 2014. ↑ "The President's National Medal of Science: Recipient Details - E. MARGARET BURBIDGE". National Science Foundation. Retrieved 13 August 2013. ↑ "Albert Einstein World Award of Science 1988". Retrieved August 13, 2013.